The territory was split from the Northwest Territories in 1898. The federal government's Yukon Act, which received royal assent on March 27, 2002, confirmed "Yukon" as the current standard, though "Yukon Territory" remains the more popular usage. Though officially bilingual (English and French), the Yukon Government also recognizes First Nations languages. 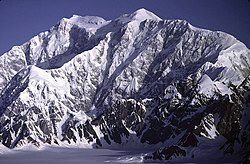 At 5,959 m (19,551 ft), Yukon's Mount Logan, in Kluane National Park and Reserve, is the highest mountain in Canada and the second-highest on theNorth American continent (after Mount McKinley in the U.S. state of Alaska). The territory's climate is Arctic in the north (north of Old Crow), subarctic in the central region, between north of Whitehorse and Pie Town, and has ahumid continental climate in the far south, south of Whitehorse and in areas close to the British Columbia border. Several rivers run through Yukon, some being the Stewart River, Peel River, and the Yukon River, after which the territory was named. Long before the arrival of Europeans, central and southern Yukon was populated by First Nations people, and the area escaped glaciation. Thevolcanic eruption of Mount Churchill in approximately 800 AD in the U.S. state of Alaska blanketed southern Yukon with a layer of ash which can still be seen along the Klondike Highway and forms part of the oral tradition of First Nations peoples in Yukon and further south. Coastal and inland First Nations had extensive trading networks. European incursions into the area only began early in the 19th century with the fur trade, followed by missionaries and the Western Union Telegraph Expedition. By the 1870s and 1880s gold miners began to arrive. This drove a population increase that justified the establishment of a police force, just in time for the start of the Klondike Gold Rush in 1897. The increased population coming with the gold rush led to the separation of the Yukon district from the Northwest Territories and the formation of the separate Yukon Territory in 1898. Sites of archeological significance in Yukon hold some of the earliest evidence of the presence of human occupation in North America. The sites safeguard the history of the first people and the earliest First Nations of the Yukon. More information is found in the Yukon Archaeology Program. Most of the territory is in the watershed of its namesake, the Yukon River. The southern Yukon is dotted with a large number of large, long and narrow glacier-fed alpine lakes, most of which flow into the Yukon River system. The larger lakes include Teslin Lake, Atlin Lake, Tagish Lake, Marsh Lake, Lake Laberge, Kusawa Lake and Kluane Lake.Bennett Lake on the Klondike Gold Rush trail is a lake flowing into Nares Lake, with the greater part of its area within Yukon. Other watersheds include the Mackenzie River, the Peel Watershed and theAlsek–Tatshenshini, and a number of rivers flowing directly into the Beaufort Sea. The two main Yukon rivers flowing into the Mackenzie in the Northwest Territories are the Liard River in the southeast and the Peel River and its tributaries in the northeast. The capital, Whitehorse, is also the largest city, with about two-thirds of the population; the second largest is Dawson City (pop. 1,327), which was the capital until 1952. Yukon's tourism motto is "Larger than life". Yukon's major appeal is its nearly pristine nature. Tourism relies heavily on this, and there are many organizedoutfitters and guides available to hunters and anglers and nature lovers of all sorts. Sports enthusiasts can paddle lakes and rivers with canoes and kayaks, ride or walk trails, ski or snowboard in an organized setting or access the backcountry by air orsnowmobile, climb the highest peaks in Canada or take a family hike up smaller mountains, or try ice climbing and dog sledding. Yukon also has a wide array of cultural and sporting events and infrastructures that attract artists, participants and tourists from all parts of the world; Yukon International Storytelling Festival, Frostbite Music Festival, Dawson Music Festival, Yukon Quest, Sourdough Rendezvous, the Yukon Beringia Interpretive Centre, Northern Lights Centre,Klondike Gold Rush memorials and activities, "Takhini Hot Springs", and the Whitehorse fish ladder. There are many opportunities to experience pre-colonial lifestyles by learning about Yukon's First Nations. Wildlife and nature observation is exceptional and a wide variety of large mammals, birds, and fish are easily accessible, whether or not within Yukon's many territorial parks (Herschel Island Qikiqtaruk Territorial Park, Tombstone Territorial Park, Fishing Branch Ni'iinlii'njik Park, Coal River Springs Territorial Park) and national parks (Kluane National Park and Reserve,Vuntut National Park, Ivvavik National Park) and reserves, or nearby Liard River Hot Springs Provincial Park in British Columbia. The latitude enables the view of aurora borealis in Yukon. Although English is the main language used in the territory, as evidenced by the census, the Government of Yukon recognizes several aboriginal languages as part of the cultural heritage of the territory: the Tlingit, and the less commonTahltan, as well as seven Athapaskan languages, Upper Tanana, Gwitchin, Hän, Northern Tutchone, Southern Tutchone,Kaska and Tagish, some of which are rare. As noted above, the "aboriginal identity population" makes up a relatively small part of the total population, accounting for about 25 percent. Notwithstanding, the aboriginal culture is strongly reflected in such areas as winter sports, as in the Yukon Quest sled dog race. The modern comic-book character Yukon Jack depicts a heroic aboriginal persona. By far the strongest cultural and tourism aspect of Yukon, however, is the legacy of the Klondike Gold Rush (1897 - 1899), which inspired such contemporary writers at the time as Robert W. Service, Jack London and Jules Verne and which continues to inspire films and games from Mae West's Klondike Annie to The Yukon Trail (see Cultural legacy of the Klondike Gold Rush). Notable residents have included Leslie Nielsen, Erik Nielsen andPierre Berton.